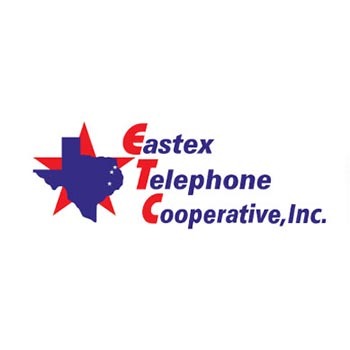 Company: Eastex Telephone Cooperative, Inc.
For Eastex Telephone Cooperative Inc., the future of delivering telecommunications to rural Texas lies in the infrastructure in the ground. “People who have not had wired broadband are starving for it,’’ said Rusty Dorman, general manager of Eastex Telephone. While new technologies such as wireless and satellite continue to grow, rural East Texas consumers and businesses will continue to rely on wireline communications infrastructure to support everything from local voice service to high-speed Internet connectivity to support online applications. Eastex — based in Henderson with offices in Livingston and Waskom — provides voice, high-speed Internet and security services for 11 rural counties with a noncontiguous regulated service area encompassing 2,165 square miles spread over about 10,000 square miles of the piney woods in East Texas. With 142 employees, Eastex currently serves more 18,000 residential and 4,000 business users. Eastex and its competitive local exchange carrier affiliate also serve more than 11,180 high-speed Internet customers. Eastex provides voice and data services to a variety of business and government customers, including municipal and county offices, schools, medical facilities, law enforcement and security installations, fire departments and forestry services. In addition, Eastex provides voice and data services to the Texas Department of Criminal Justice, the Trinity River Authority, Luminant mining and trading operations as well as the Alabama-Coushatta Tribe of Texas and Naskila casino. Eastex was founded in 1950 in Rusk County as one of the first telephone cooperatives after the larger telephone companies declined to provide service to rural East Texas. Congress had approved the Rural Telephone Act in 1949 which provided low-interest loans from the Rural Electrification Administration (now the Rural Utilities Service under the U.S. Department of Agriculture). Just as the administration had helped power rural United States with electricity, the availability of low-interest loans led to growth and a new quality of life for rural Texans with the availability of telephone service. From its early days with little more than 200 subscribers, Eastex has continued to grow. Eastex has invested and expanded its networks by upgrading copper networks and deploying fiber-to-the-home projects to meet business and consumers increasing demands for high-speed Internet connectivity. At the end of 2017, Eastex had invested in 5,000 route miles of copper plant and more than 700 miles of fiber optic networks. In addition, Eastex network includes 21 Genband CS1500 soft switches, nine Remote switches, and 336 Digital Subscriber Line Access Multiplexers ( DSLAMs). Still, with fewer than 7.97 customers per square mile and about 3.5 customers per route mile, it is challenging to deliver telecommunications services to such a large rural area. With the cost of building new networks to sparsely populated areas, Dorman said support from the Texas universal service fund remains vital. Large portions of Eastex’s service territory are covered with national forest, which requires extensive permitting to deploy new networks. These forests include portions of four national forests, including Sam Houston, Angelina, Davy Crockett and Sabine. Special use permits must be sought, and precautionary measures followed to ensure forest areas are preserved and protected. Before the cooperative may bury any cable or fiber, for example, rights of way must be granted by the United States Department of Agriculture’s Forest Service. Additionally, environmental assessments must be performed before approval is granted, causing a delay in deployment and creating additional expenses for the cooperative. “It has taken us at times two years’’ to obtain a permit, Dorman said. As a large employer in rural East Texas, Eastex employees live and work in local communities and the company plays an active role in local and regional educational and economic development initiatives. Wired infrastructure to support high-speed connections will remain important to support economic development – particularly as wireless service is spotty throughout the piney woods of East Texas, Dorman said. “If you get off a major thoroughfare, you are not going to have a (cellular) signal very long,’’ Dorman said. Mobile cellular networks depend on wireline backhaul connections to cell sites, linking cell towers to a backbone of voice and data networks that support everything from voice calling to streaming video. Eastex works with wireless carriers in agreements to carry wireless backhaul traffic and Dorman sees new opportunities in the future. Still, consumers’ growing demand for high-speed Internet connectivity will drive continued growth of fiber technologies in rural areas. “Right now, our growth seems to be fiber-to-the-home,’’ Dorman said.